The interim Union Budget presented by the interim Finance Minister on 1st February 2019 maintained the remarkable consistency this government has shown in short-changing the Armed Forces for the fifth successive year. In an election year this is not entirely unexpected as the government’s obvious priority is to win the election and therefore focus on those sectors which translate into votes. However, there are certain imperatives that should transcend petty political considerations with national security ranking high in that list. The interim Finance Minister’s statement that this is the first time the defence budget has crossed Rupees 3 lakh crores implying that he had given it the importance it deserved sounded as hollow as the thought behind it and gave credence to the famous quote which Mark Twain attributed to Benjamin Disraeli “There are three kinds of lies – lies, damned lies and statistics”. This statement fell in the third kind which Wikipedia describes as the use of statistics to bolster weak arguments. It was rightly stated that this is the first time the defence budget has crossed the Rupees 3 lakh crore milestone but what has not been stated is that this is the lowest ever allocation as a percentage of GDP since the Chinese drubbing of 1962. History has a habit of repeating itself and therefore one ignores the lessons of history at one’s own peril. While it has been repeatedly articulated that a GDP share of 3% would be the aspiration, the current figure is hovering around the 1.5 % mark which is even less than those countries that do not have any immediate threat to their territorial integrity. India on the other hand has two belligerent and adversarial nuclear armed neighbours with an unholy nexus between them. Both of these have defence budgets much higher than ours in percentage of GDP terms. (China’s defence budget is almost four times that of India’s in real terms also and this is evident in their aggressive posture in establishing their presence wherever they deem it necessary to do so}. When this government came to power with a massive mandate in 2014 there was an expectation that the nation’s security challenges, both external and internal, would be adequately addressed and the equipment shortfall that had occurred during the 10 years of the UPA regime would be reduced. However, in its five years, this government has actually reduced the defence budget, both, in real terms and also as a percentage of the country’s GDP while expecting the Armed Forces to meet greater challenges than ever before. If one were to assess the increase in GDP in this decade (almost 140%) the increase in defence budget has been just a little over half of that (approximately 78%). This in itself is a telling statistic! In the last five years the country has been projected as an emerging power. The Prime Minister’s proactive foreign policy initiatives and his strategic defence relationships with most countries in the region and beyond has led to the Indian Armed Forces operating at an unprecedented tempo while resources have been dwindling. This dual challenge has placed a tremendous strain on them, the effects of which are already discernible and will soon become increasingly obvious. In the last couple of years this concern has been voiced by the senior brass of the Armed Forces at various fora; the Vice Chief of the Army made a scathing presentation on this in parliament ; the Air Chief on more than one occasion has lamented the reduction in aircraft numbers – the IAF is down to 26 squadrons from the sanctioned 42 with little sign of recovery in the next few years, the impending arrival of 36 Rafale jets notwithstanding. The Chief of the Naval Staff who is also the current Chairman of the Chiefs of Staff Committee has alluded to the shortfall in resources and even went so far as to convey that the delay in the shipbuilding programmes may actually not be such a bad thing. This is despite the fact that the Indian Navy did not commission a single ship in 2018 (despite almost 40 ships on order or being built in Indian shipyards) at a time when the 21st century is being termed the maritime century with the Indo-Pacific being the global geo-economic centre of gravity. India, as the predominant Indian Ocean power is expected to play a leading role in ensuring the safety and stability of not only its own but also the region’s maritime interests and the safety of trade that transits through these waters (close to 100,000 ships per year). Indian has also mandated itself as a provider of net security in the region. A strong well balanced full spectrum capable navy is therefore a national imperative. However, a capacity and capability deficit exists which, regrettably, is widening by the day. To draw a broad comparison with the other Asian power and a possible competitor, the Chinese navy has added more ships to its Fleet in two years than Indian has in twenty! With its increasing focus on the navy being the primary instrument in its plans for global supremacy, the gap between our two navies is already unbridgeable. The constant reassurance that the PLA(Navy)’s ability to operate in the Indian Ocean poses little threat to the Indian Navy may well be a thing of the past sooner than we can expect. However, this year’s budget allocation is further indication of the indifference towards a clear and emerging threat which is quite inexplicable. Armed Forces don’t get built in a day – it takes time to build the requisite capacity and capability to ensure that they are trained, equipped and ready to operate from a position of strength. Operating at the extremes of material and physical endurance due to constrained resources is not the best way of doing so. However, the inability of the political leadership to appreciate this, which in turn is being advised by a generalist bureaucracy that is impervious to anything beyond their domain of limited expertise, is a malaise that has pervaded the hallowed corridors of South Block since independence. The problem actually is two-fold. On the one hand, the fund allocation is in itself inadequate to address the country’s existing and emerging defence requirements. This can perhaps be justified to some extent by the eternal guns versus butter debate for a developing economy like ours. However, on the other hand, what is inexcusable is the tardy decision making of the Ministry of Defence, the inefficiency of the state-owned defence industrial complex which the MoD controls and the repeated inability of the country’s gargantuan Defence Research and Development Organisation to deliver on its lofty promises. The consequent sub-optimal utilisation of the already limited funds further exacerbates the situation. This often leads to allocated funds being returned unspent. The long term 15 year plan and the more immediate 5 year plans drawn up by the Armed Forces to meet their requirements (and which have the MoD’s approval) are more often than not redundant even before the ink has dried on them. In a macro-context, the problem stems from the organisational structure of the Ministry of Defence. As per the government’s rules, the Armed Forces Headquarters are not an integral part of the MoD and therefore have little say in decision making. It is the Armed Forces which are the end users and have the professional knowledge to determine the country’s military requirements. They are therefore the best placed to plan and prioritise within the budget that is allotted to them. However, the MoD is manned and staffed by civilian generalists drawn from various government departments other than the Armed Forces. The only concession made to the Armed Forces is the inclusion of a single Joint Secretary level officer from each service as a Technical Manager in the Acquisition Wing of the MoD. The exclusion of the Armed Forces from the decision making structure of the Defence Ministry is an organisational dysfunctionality that begs reform but is rarely addressed. 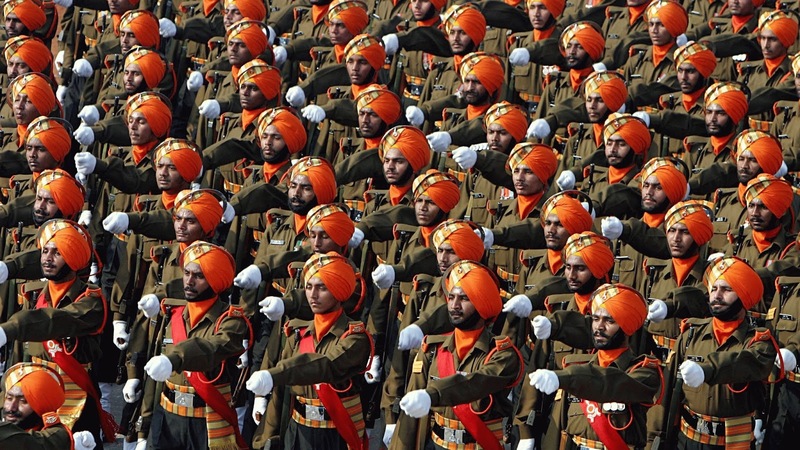 A common refrain heard very often is that the pay and pension bill strains the limited resources of the armed Forces. However, little is spoken of the huge civilian work force being paid from the Defence Services Estimates. Inefficient organisations with little relevance in a contemporary tech savvy environment continue to have a bloated work force which can and should be reviewed and reduced. This civilian element accounts for a substantial portion of the pay and pensions bill. There is also no denying the fact that there is perhaps room for optimising the military’s strength in the emerging security environment where technology should be harnessed as an effective force multiplier. However, a military cannot be structured for the 21st century equipped with 20th century legacy systems. An inadequate defence budget is a reality that the country must come to terms with. There is little chance of this changing drastically in the near future. A comprehensive review of the existing organisational structures in the MoD and the need to align with best global practices to promote efficiency is therefore essential to get the maximum bang for the limited buck. Capability gaps in our defence preparedness which are reaching alarming levels need to be addressed with the urgency they deserve. If India indeed aspires to establish itself as a regional power and wishes to shape the future of the global order, an invulnerable security architecture is not only a military requirement but a national imperative .